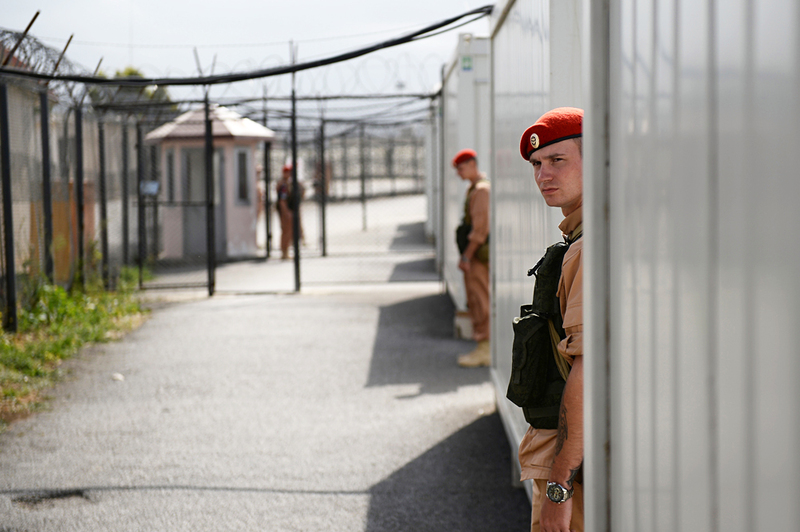 Nikolai Litovkin, RIR correspondent, travelled to Russia’s Khmeimim airbase in Syria and found out what life is like for the troops quartered there. He also saw what life was like for those who were involved in demining the historic city of Palmyra. Our IlyushinIl-62 plane carrying 150 journalists from Moscow arrived at the Russian military base in Khmeimim in Syria early in the morning of May 4. A delegation of Russian generals and colonels who head the air force operation there met us. As we were getting off the aircraft, an Su-35S 4++-generation fighter took off from the neighbouring runway. Igor Konashenkov, director of the Russian Defence Ministry's press office, said the operation against the militants of Islamic State (ISIS) and the Al-Nusra Front was continuing, despite the withdrawal of a significant part of Russian bombers and fighters from Syria in the middle of March 2016. "Our fighters and bombers are heading for the areas around the cities of Raqqa and Deirez-Zor, where heavy and long fighting with ISIS awaits them. Mission flights are carried out day and night. In the last four days the Russian aviation has conducted 87 military flights," said a major general on May 4. A Russian soldier's day in Syria begins at 6:00 a.m. with the alarm: rising, forming companies and a morning march of two - three miles. The soldier is then given 10 minutes to freshen up and go have breakfast. The officers said the best Russian soldiers were participating in the Syrian operation, soldiers "who are as efficient as Swiss watches." All soldiers are on contract, there are no conscripts. There are many young women in the base who live in separate barracks and work mostly as medical specialists. Along the perimeter of the base many radar systems are visible, as well as the Pantsir-S1 and ZRK S-400 anti-aircraft missile and gun systems. The airbase guard also comprises of special purpose units, paratrooper forces and a marine corps. The soldiers who do not have direct combat or defence objectives take care of the land and air equipment, beginning with the BTR-82A and Tigr armoured vehicles, and ending with the Ka-52 combat helicopters, the Mi-28Ns, fighters and bombers. The base also boasts of a library and an improvised movie theatre where the servicemen watch the news and films on weekends. For psychological and spiritual issues, the base has a psychologist and a priest. Archpriest Dmitry Solonin says when people stand on the threshold between life and death, it is common to think of what will happen afterwards. The Russian engineer corps began demining the ancient city of Palmyra on April 2. More than 100 sappers worked on removing explosive devices from the city. In areas neighbouring the Russian sappers' camp, clashes are still taking place with the Al-Nusra Front. The terrorists are located in the town of Sukhne, 30 miles from Palmyra, and regularly try to recapture it. The arrival of journalists in the Russian sappers' field camp was accompanied by an artillery cannonade on terrorist positions. Lieutenant General Yury Stavitsky, head of the Russian engineer corps in Palmyra, said the sappers had cleared 825 hectares in the city, 8,500 buildings and structures and discovered and defused almost 18,000 explosive devices. Stavitsky said there were well prepared sappers among the terrorists, who were able to create new models of explosive devices. Other than the traditional demining and canine units, the advanced Uran-6 robotic systems are also taking part in the operation. The specialists from the engineer forces have now fully cleared Palmyra's area of explosive devices and are currently training Syrian sappers. Regular soldiers, meanwhile, are now waiting for the order to close the camp and hear the cherished phrase: "Time to go home."